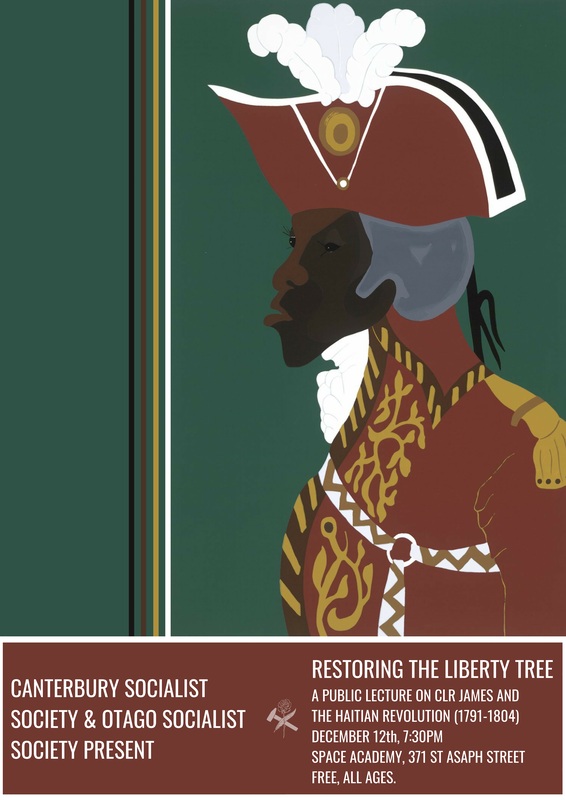 The final event for the Canterbury Socialist Society of 2018 is a guest lecture from Gareth of the Otago Socialist Society on the Haitian Revolution. Gareth will be presenting an overview of the Haitian Revolution and its most famous historian – Trinidadian Marxist C.L.R. James. The lecture will cover the colonisation of Saint-Domingue, the social makeup of slave society as it stood on the eve of revolution, and the long periods of warfare that led to the independence of Haiti on January 1st 1804. The Haitian Revolution unfolded at a critical time in the political formation of the modern world. As the French Revolution gave teeth to concepts like liberalism, democracy, and socialism, this less remembered revolution among one of the most viciously exploited populations in the world questioned how far these ideas would be extended. The lecture will be introduced by CSS Exec member Sionainn, and run for approximately 1 hour 15 minutes. We will then break for ten minutes and return (pint, cola, or cup of tea in hand) for questions and discussion. All are welcome to attend and no background knowledge is necessary. If any attendees would like to familiarise themselves with James’ work, an online copy of the text is available here.